Dental abscess is a serious dental emergency, which is often misunderstood. Its consequences range from compromised oral health to life threatening conditions. Unfortunately, people think abscesses can simply go away on their own. Sufferers would rather wait it out than go to the dentist, not knowing that once a dental abscess appears, it can only worsen until a dentist intervenes. That’s why we at Forster Dental Centre dedicate ourselves to educating our patients. We not only help our patients with their dental needs but also teach them how to care for their teeth. A same day emergency appointment is available! Dental abscess is the accumulation of pus at the site of an infection. Pus is comprised of dead leukocytes (white blood cells). It has a whitish-yellow appearance and is protein rich. The abscess appears as a pimple shaped lump on the gums, tooth, or bones that hold the tooth. It grows bigger as it worsens. They appear one or two days after a bacterial infection. Since the abscess can also be located in an area where it may not be visible, it is important to know the telling signs that you might have one. 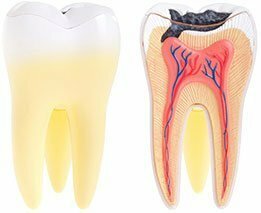 What Happens To An Untreated Dental Abscess? If untreated the dental abscess can spread to other parts of your body. If it reaches the brain, it can cause meningitis or brain abscess. Some rare cases also lead to sepsis, Ludwig’s Angina, or septicaemia. All of these are life threatening issues and require extensive medical attention. Rinse with an antiseptic mouthwash. Other alternatives are a saltwater solution (1/2 teaspoon of salt = 8 ounces of lukewarm water) or peppermint tea. To minimise dental pain and tooth sensitivity, take OTC pain relievers. Do not put aspirin on the affected area as this can cause a chemical burn. The success of the treatment depends on how prompt you are in seeing in your dentist. To treat the abscess, the cause is determined and addressed. Simply draining the pus won’t cure it; the abscess will eventually reappear. A dental emergency requires a skilled team to remove you from pain and danger as soon as possible. We have same day emergency appointments for dental emergencies. Forster Dental Centre provides comprehensive dental services for families in Forster, Tuncurry, Great Lakes region, Pacific Palms, Smiths Lake, Coomba Park, Failford, Hallidays Point, Old Bar, Taree, Manning Point, Nabiac, Gloucester, and Wingham. You could say we are happy to provide quality dental care from Bulahdelah to Harrington and everywhere in between!